We feel gardening is therapeutic and satisfying, but then we do get to do the thing we love for our day job. We appreciate that for those of you who have other day jobs then coming home to do your garden after a long day at work may not seem quite as appealing. We offer you a helping hand with our stress free garden maintenance in Bispham. You might decide there are certain jobs you enjoy doing but would like us to handle a list of other garden tasks or you may just want to sit in the garden and relax without having to worry about any gardening task. Whatever your need we provide garden maintenance in Bispham that will be perfect for you. Great garden services Bispham is not only about doing a good gardening job but about being reliable and trustworthy. Turning up on time, successfully carrying out the work actually agreed upon and tiding up after the work is carried out. These are aspects and principles of our garden services Bispham that we strive to maintain always. Let’s be honest any living thing that we value and enjoy the benefits of we have to maintain with a bit of TLC. There are no exceptions for your beloved garden lawn. 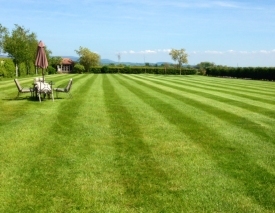 We offer a variety of lawn treatments in Bispham for your garden. As a beautiful garden lawn will give you a beautiful view, delightful place to sit and dine and a practical safe place for children to play then it really deserves some tender loving care and investment. Our effective lawn treatments in Bispham are tailored to fit the needs of the lawn after a thorough assessment and consultation with the homeowner. We love working with decking, flagging and patio paving. It really allows us to be creative. Whether you want decking, flagging and patio paving for creating a dining area, playing area or even a driveway then we can help you think about the benefits of each material and how they will look and feel and how you will have to maintain the material. Maybe you already have decking, flagging and patio paving but they need cleaning or maintenance, we are happy to help with any of these issues. We find that when jet washing driveways for our customers; many are not only very pleased with the results but often surprised at why they have not done this sooner.. We can promise wonderful results are to be had from jet washing driveways, not only practical ones (health and safety) but also the overall result of transforming a grimy, weedy driveway into a beautiful, like new driveway.